The Beatles. An original 8 x 10 black and white photograph of The Beatles which was taken in the Bahamas when the group were filming their second feature film HELP! 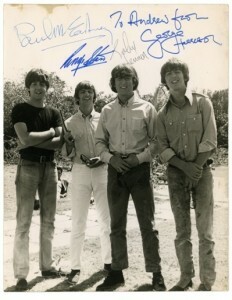 that has been signed on the front by all four members. John Lennon has signed in black ballpoint pen, Paul McCartney has signed in blue ballpoint pen, George Harrison and Ringo Starr have signed in blue felt tipped pen. George has added the dedication that reads ‘To Andrew from’ above his name. All of the signatures are very well placed and formed. The autographs were obtained by a camera man that was working on the film for his nephew who subsequently gave them to his girlfriend at the time. Comes with a letter from the girl that received the autographs from her boyfriend. The Beatles arrived in New Providence in the Bahamas on February 23rd 1965 and filming in various locations in the area until March 9th. The autographs also come with a very rare original working script from HELP! which in its early stages which just titled ‘BEATLES TWO’. The script has 124 pages. The front and back covers are detached. Measures 8.5 inches x 10.9 inches. The photograph measures 8 x 10.1 inches. The photograph has some light creases in various places and some slight staining at the top. Overall very good. Certificate of Authenticity by Tracks. Previous PostOLIVER HARDY AUTOGRAPHNext PostNEVER SEEN BEFORE MICHAEL JACKSON FIRST MOVIE PRESS RELEASE 1978 “THE WIZ” SIGNED!